Arriving at Delhi airport and wondering how to transfer from the airport to your hotel? There are a number of different ways, depending on your budget. Here are the options. 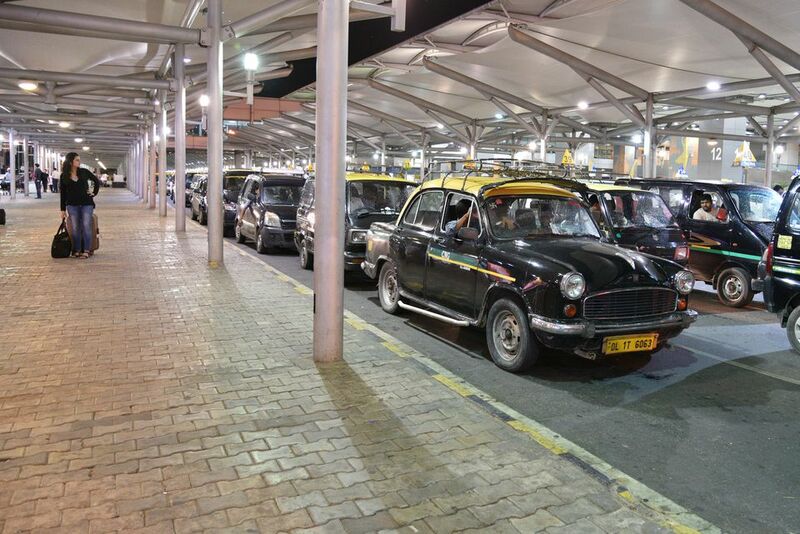 The most popular way to get to your hotel from Delhi airport is by taking a prepaid taxi, the operation of which is overseen by Delhi Traffic Police. When exiting the airport, taxi drivers must give their name, number, passenger's name, and destination to officials at the Delhi Traffic Police check-post. You'll find pre-paid taxi counters in both the domestic and international arrival areas. At international Terminal 3, there's a counter inside the terminal and another at the taxi bay outside. It's best to go to the inside counter, so you're not harassed by touts. After paying the fare at the counter, you'll be given two receipts (one green and one pink) with the number of the taxi on it. The green receipt is to be handed to the driver at the end of the trip. Make sure you hold onto the receipt until you safely reach your destination -- don't give it to the driver beforehand. The driver needs to have the receipt to get paid by the taxi office, and it can be a good negotiating tool to ensure that the driver does take you where you want to go. This is especially so if he starts trying one of the popular scams, such as not knowing his way to your destination or saying your hotel has closed down (which is highly likely!). Rates are fixed by the government. Expect to pay 400-500 rupees to the city center, including Connaught Place and Paharganj. A night surcharge of 25% is applicable between 11 p.m. until 5 a.m.
Do note that the prepaid taxis don't have air conditioning. Ubar and Ola (the Indian version of Uber) are available at the airport and will pick you up from a designated spot outside the arrivals area. Uber is generally cheaper than Ola. Fares are dynamic and increase according to demand (surge pricing). If taking an Uber, expect to pay around 270 rupees upwards to Paharganj and 250 rupees upwards to Connaught Place. However, the cost could realistically be 450-500 rupees from Terminal 3. You'll need Internet and the relevant apps installed on your phone to be able to use these services. Private companies such as Meru Cabs, Mega Cabs and Easy Cabs have counters at the domestic and international terminals. Their vehicles are also lined up outside in the arrivals area. These taxis are more expensive than the above two options. However, they're air conditioned and have Global Positioning Systems. The fare is 69 rupees for the first 3 kilometers, and then 23 rupees for every additional kilometer. There is also a 25% night surcharge. Expect to pay about 600-700 rupees to the city center. However, you can get cheaper fares with Meru if you book on their app. You can phone other "radio taxi" services to pick you up as well. These taxis are referred to as "radio taxis" because you can't hail them from the road. You have to call them to come and get you. Many hotels will pick you up from the airport. Expect to pay about 1,000-3,000 rupees for the service, depending on class of hotel. The cost will include airport parking charge, and entry fee to the arrivals area for the representative that's collecting you. Alternatively, Viator (in conjunction with TripAdvisor) offers private hotel transfers from Delhi airport that you can easily book online. A Delhi Metro Airport Express train line, known as the Orange Line, runs from international Terminal 3 and the new AeroCity hospitality precinct to New Delhi Metro Station (located opposite New Delhi Railway Station near Paharganj). Trains depart every 10-15 minutes, from around 5 a.m. until 11.30 p.m. The journey takes 20 minutes and costs 60 rupees. The station at Terminal 3 can also be readily accessed by passengers traveling through domestic Terminal 2, as the terminals are within five minutes walking distance of each other. There's now a regular Metro train station operational at Terminal 1D, on the Magenta Line. However, doesn't have the same facilities as the stations on the Airport Metro Express Line, and baggage limits apply. The Magenta Line runs from Janakpuri West to Botanical Garden. People who are staying in South Delhi may find this train line useful. Key stations are Vasant Vihar, RK Puram, Hauz Khas, Panchsheel Park and Greater Kailash. Delhi Transport Corporation operates a regular Airport Bus Service from Terminal 3 to central Delhi. There are departures every 10-20 minutes around the clock. Stops include Connaught Place, New Delhi Railway Station, the Red Fort, and Interstate Bus Terminus at Kashmere Gate. There are also bus services from Terminal 1 and 2. See timetable here. The buses are air conditioned and comfortable. Punctuality can be an issue though, due to the heavy traffic in Delhi. Therefore, if you have a bus connection, make sure you allow plenty of time during peak hours. EATS (Ex-Servicemen Airlink Transport Service) buses run less regularly.